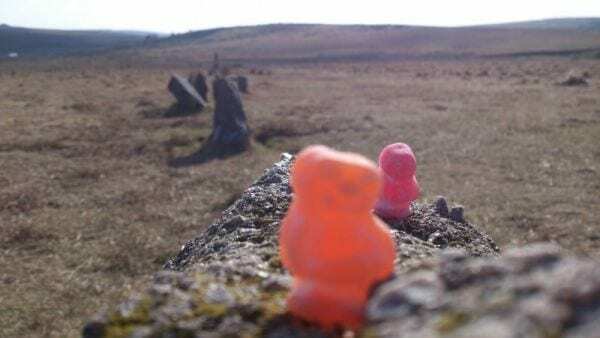 This Dartmoor walk is possibly at the edge of what you would call a ‘short walk on Dartmoor’ but it passes through some great scenery and points of interest so just do as much as you want, and then turn back to the delights of Princetown. Princetown is easy to find, despite the fact that it is often shrouded in mist. a) The Plume of Feathers is even easier to find, but you are not allowed to go in … yet. Take the path onto the moor that leads past the pub car park entrance and keep walking until you get to South Hessary Tor. b) Keep following this track (move aside for bikes) until you come to Nun’s (Sewards) Cross. Stop here to explore Nun’s Cross farm and the Devonport Leat tunnel. c) Follow the track round to the ruins of Eylesbarrow tin mine. 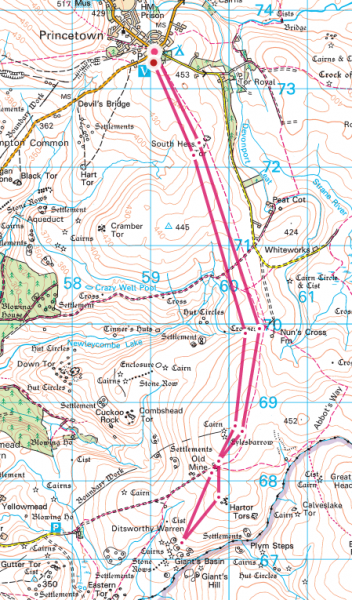 d) Set a bearing of 164 degrees and head over to Higher Hartor Tor (450 metres). e) The superb stone rows and cairns of Drizzle Combe should be in your view now; but if Drizzle Combe is living up to its name, you might need to walk on a compass bearing of 227 degrees for 850 metres. f) Once you have explored the antiquities, head north until you pick up the Eylesbarrow track again, and follow it back to Princetown. Now you can go into the pub. The sausages and pies are great, but make sure that you drink a Dartmoor Brewery beer!